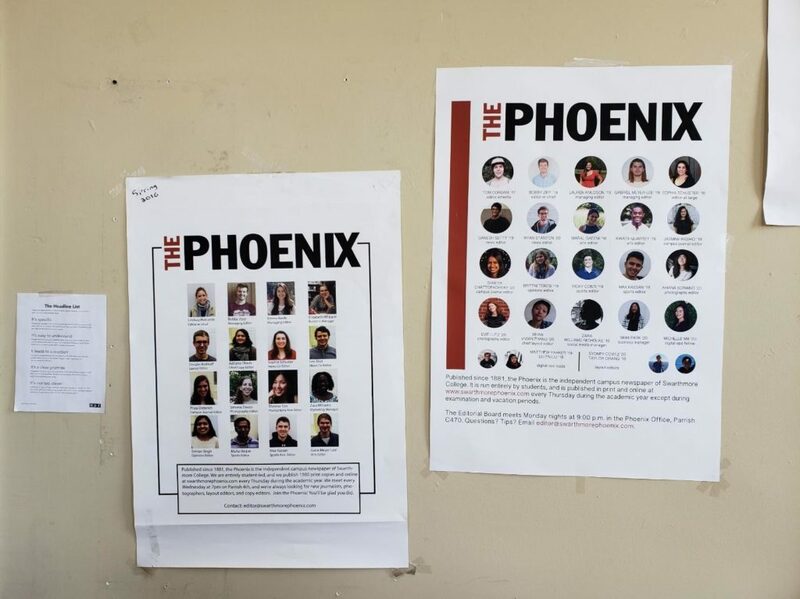 Published since 1881, The Phoenix is the independent campus newspaper of Swarthmore College. It is run entirely by students, and is published in print and online at www.swarthmorephoenix.com every Thursday during the academic year except during examination and vacation periods. These mastheads of past Editorial Boards hang crookedly on one of the walls of our office next to a giant banner with our logo printed on it. The Phoenix is one of the few student-run organizations that are lucky enough to have a dedicated on-campus space. It is consequently impossible to step into the office without feeling a strong sense of institutional memory — and, frankly, claustrophobia. Come on in, and meet The Phoenix! 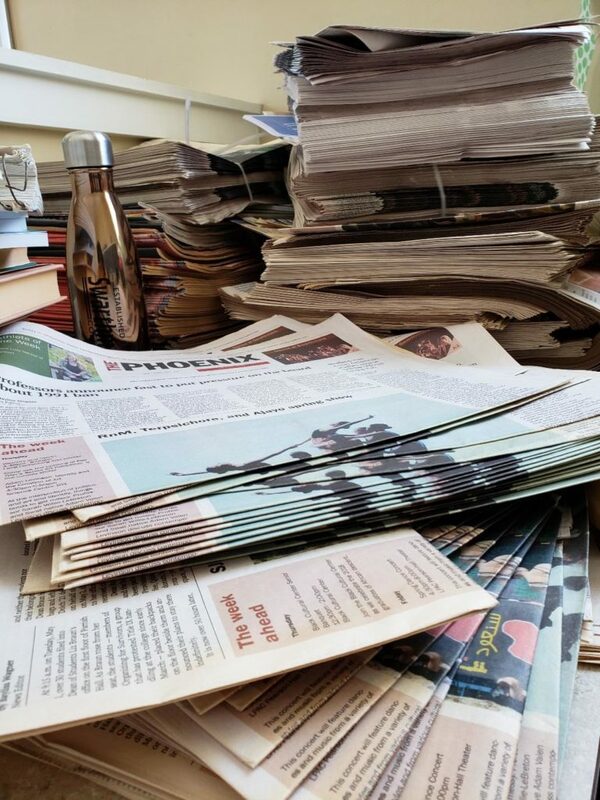 Hidden on the mysterious fourth floor of Parrish across from WSRN, our office shrouds itself in stacks of old Halcyon yearbooks, copies of “The Review,” and of course, countless boxes of The Phoenix. Ghosts of past Editorial Boards sadly watch as the unread, undistributed papers continue to pile up every month. The inside of the office is no tidier — it’s often difficult to find adequate desk space among the ripples and waves of Phoenixes. One day I fear that I will walk into the office and find my fellow EdBoard members suffocating and drowning in the stray papers. Old iMacs clutter the tables in the back half of the office. Layout editors continue to use a few of them, but most probably have not been turned on in years. A paper sign affixed to one monitor reads, “Also DEAD #RIP,” which leads me to wonder how many of the computers are dead. 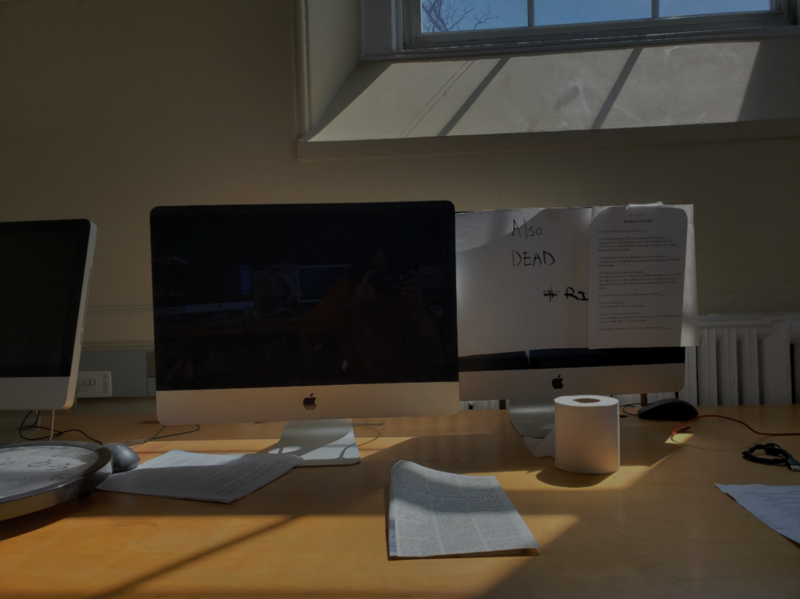 A single roll of toilet paper sits in front of the dead monitor. It mocks us. Like much of the riff-raff in the office, nobody knows how long it has been there, nor where it came from. Nevertheless, it comprises part of our institutional memory now. 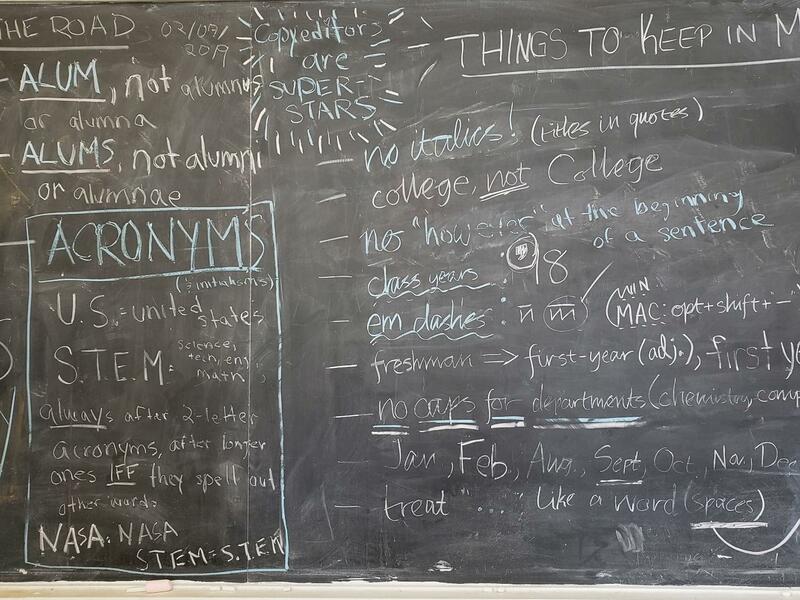 Our copy editing board forms a key component of our office, and represents our office well, because of the manner in which a verbal muddle tends to accumulate on the board. 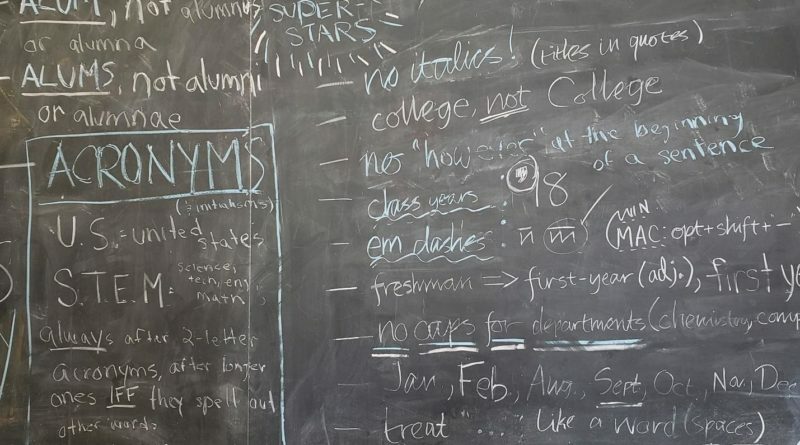 The rules written on the board in blue and white chalk have been there since time seemingly immemorial, and when I recently erased a list of rules that had become irrelevant, the erasure became a cause of some grief in the office. The Phoenix’s office, no matter how much time I personally invest into attempting to tidy up and explore the crevices of the office, will always hold a sense of wonder from years’ worth of Swat students making the office into a type of home. It is profoundly difficult to grasp how much stuff that Swatties have managed to fit into that space, and how long it takes for those forgotten trinkets to resurface. If an eternity here consists of four years, then it’s fair to say that some foundational items in the office are nearing an eternity’s worth of life, and some are older even than that. How many memories remain buried under stacks of old newspapers and within the hard drives of long-dead computers? It is futile to want to know.